I only saw two good horses today. The first was an absolute standout grey filly in the three-year-old race, Girl In Flight. Totally relaxed, no faults, head in towards the strapper. Too short to back at $1.30 for the place. It won like something special. The other one was King Buddy in the sprint. Also no faults, last on the turn, and somehow, I still don’t know how, it jumped out of the ground to grab third at $4.10 for the place. My only bet for the day. I think I owe courageous young jockey Harry Coffey a drink, once he turns eighteen! The forecast was not good and so it turned out with heavy showers sweeping across the valley and then the occasional burst of sunshine. There was no one there to get wet. Only eight rails bookies betting on the locals and two doing interstate. I suppose they were all out Christmas shopping. I couldn’t work out if it was hot or cold, until finally deciding that it was humid. 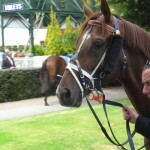 And so I was confined indoors for the first few races, with no chance to get out the back and look at the horses. Probably a day for photography. I reached for my camera to photograph Thubiaan with Chris Waller’s distinctive combination of ear muffs, tongue tie and white noseband. Uh, oh! A warning message. Replace the battery pack. Oh no, a flat battery. So much for photography. Maybe it was a day to throw out all horsewatching principles! Then I remembered Thubiaan’s win in similar conditions out at a Sandown mid-weeker last year. He was showing $2.10 for the place on the tote and $2.30 with the books with 0 minutes to go. So for the first time in a long time I went for the books. The horse was just beaten by Anudjawan, an 8-year-old that has only won one other race! And to my dismay the tote ended up paying $2.40! It was certainly that sort of day. A day for extreme care! So only one other bet on a fit looking Vatican parading with its head down and a positive strapper. And the tote price was a reasonable $2.40. I always look forward to Sandown Cup day. It’s a sort of suburban Cup day. A big crowd because of the abundance of free tickets, but still plenty of room to move. And the weather is usually warm, hot even, with summer on the way. But it was all wrong today. 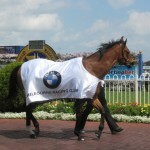 The meeting was held at Caulfield while they dig up the track at Sandown. The weather was still cold. And I got held up by home duties and missed the running of the Cup altogether! It’s hard to recover when you get off to a poor start. Zipping was trotted out before the Zipping Classic, a race named in his honour as a four-time winner. I wonder – how is the old boy? How is he ageing? Holding up? Or going to the pack like the rest of us dinosaurs? There were no answers because he was covered up in a rug! An advertising opportunity! What is the point? Why present a horse to horsewatchers around the mounting yard if you can’t even see him? And another thing. As previously reported the old tote board is history, but did you know that you can’t even see the replacement tote screen from the mounting yard! What is the club thinking? A quiet contemplative day. Only one bet on Patricia Dawn in the fourth which managed to get third at $3.00 the place. And a couple of photos. A terrific triple gear combo of Norton bit, cross-over noseband and winkers on Felidea and a near miss on a decent photo of Mister Milton’s bar plates. Leaving Flemington I was asked whether I had a successful carnival. I replied that I was very successful, were you? And the answer? No, not on the punt, but very successful socially. And that made me realise why I was successful. I am anti-social! Thirty-seven races and only twelve bets for the week, six winning place bets, one winning each-way, and three losers. Plus two successful lays. I missed another lay on the favourite in the VRC Sprint Classic, Lucky Nine, who was cribbing, or chewing on the woodwork, in his stall. 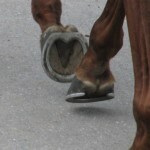 This is rarely seen at the track since most strappers would take the horse in hand. I managed a decent video which joins my Youtube collection. I was so busy patting myself on the back about the video that I forgot to lay it! And I got another good video on Cup Day of Rose Pattern performing an intriguing and repetitive lip stereotypy. I didn’t bet in the Stakes mainly because the favourite Boban looked terrific but had the cross-over noseband, so I left it alone. Saved myself for Sertorius and Longport in the last two races to go out on a high for the week. Did you see my favourite horse Rockpecker go around? Ten years old, but it wouldn’t be the last race on the card of the Flemington carnival without him! And at least he gets $1200 appearance money for finishing ninth at 100/1. First of all cross out the nose rolls – Dunaden, Voleuse De Coeurs, Hawkspur, Verema; then the cross-over nosebands – Super Cool, Masked Marvel, Royal Empire; and then the bar plates – Ethiopia (but not confirmed visually). That leaves 16. Then the kickers – Mount Athos (damn! ), Mourayan; then the head-up horses – Seville, Dear Demi, Tres Blue; then the ears-back horses – Green Moon. Then the horses not happy with the bit – Brown Panther, Mount Athos (damn!). Then the horses for no reason at all – Ibicenco. I’m left with Red Cadeaux, Sea Moon, Fiorente, Foreteller, Dandino, Fawkner, Simenon, Ruscello. The standout? Fiorente from Red Cadeaux. I had a small go at the trifecta but missed Mount Athos. Five out of the first six. Next year I might have a go at the first four. But for the first time in a long time I had a win on Cup day. 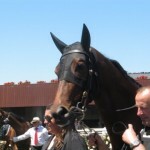 Fiorente! Each-way forever! And I’m a place punter. The greatest day’s racing on earth. But it started out on the wrong foot. There were no buses from the main gate to the turnstiles which meant that all the geriatrics had to foot it for what must be nearly a kilometre. An enquiry elicited that it was a cost-cutting exercise. The VRC, the miserable bastards. And prices are up. A racebook is $8 and the pen penalty, if you left yours at home, is $4. And the promised Flemington wi-fi doesn’t seem to be working yet, so laying looks to be off as well. Moan, moan. Nothing like a good old moan. Derby Day is all about fashion, and the horses are no exception. The latest fashion is ear muffs, probably triggered by the success that Chris Waller is having with them. Even Gai tried them out on Vaquera. 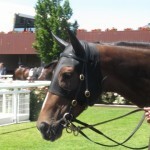 In fact, there were four horses in the Hotham with muffs –Kelinni, Vaquera, Motivado and Garud. Garud combined the muffs with a one-eyed blinker. But the winner Ruscello had a clean head. 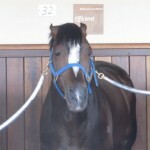 In the Mackinnon the favourite Jet Away was looking very snaky in his stall with his ears laid right back. 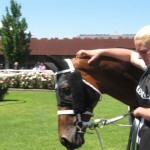 On entering the mounting yard he did the most monumental sloppy dump which must have splattered out over 30 metres! The lay of the year! I whipped out the iPhone straight away, but didn’t hold out much hope. I got on to Betfair OK but there were revolving suns everywhere on the jockey colours, although the market was visible, but wouldn’t refresh. I submitted my bet, a lay for the place at $1.56, put the phone in my pocket, and hoped for the best. 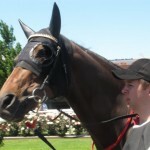 Jet Away finished sixth, not a bad effort considering his mood. Four bets for the day for two winners (Kirramosa, Red Tracer) and two losers (Thump, British General). Home and a quick check of Betfair. I got on.